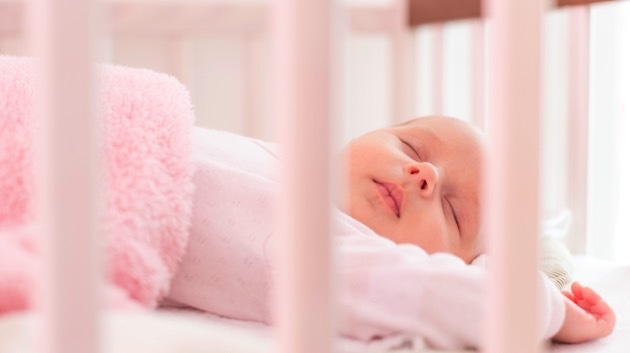 Parents may unwittingly be placing their babies at increased risk of dying by putting them to sleep in ways that make sudden infant death syndrome and other forms of sleep-related death more likely, a study finds. (NEW YORK) — Many parents may unwittingly be placing their babies at increased risk of dying by putting them to sleep in ways that make sudden infant death syndrome (SIDS) and other forms of sleep-related death more likely, according to a small new study published in the journal Pediatrics Monday. Researchers at the Pennsylvania State College of Medicine studied video camera footage of more than 160 infants, which was recorded while they slept. The research was originally aimed at determining new mothers’ preferred sleeping arrangements. But as one of the researchers, Dr. Ian Paul, reviewed the footage, he noticed that in many cases, infants were being put to bed in unsafe ways — such as being placed on their sides or put into cribs full of potentially dangerous items. “I was surprised and alarmed,” said Paul, a professor of pediatrics and public health sciences at Pennsylvania State College. The researchers also found that parents would put the babies on their sides or stomachs, or practice “co-sleeping” — the act of sharing the bed with their infants. These practices, too, put babies at risk of suffocation or injury. The study also found that when infants were moved to a different sleep environment in the middle of the night, babies tended to end up in even more unsafe conditions. According to the U.S. Centers for Disease Control and Prevention, about 3,500 U.S. infants die of SIDS every year. To help deal with this problem, the National Institutes of Health launched the Safe to Sleep campaign, which is designed to educate parents on actions they can take to lower their child’s chances of sleep-related death. Besser added that the observation that babies who were moved in the middle of the night tended to be placed in more dangerous situations is important.